During the last three days that I have been privileged to be in your beautiful and friendly country I have felt the warmth and welcome of the Turkish people. Today your amity and goodwill are manifest with this invitation to me to share a meal with you. The warmth that I have perceived in our interactions today is reflective of the potential that exists for bringing our two countries closer. I accept this as a tribute to our shared cultural, linguistic, social and civilizational experiences. For me and my delegation, it has been a privilege and pleasure to be here and to learn firsthand about Turkey, its people, its history and its grandeur. I thank you, Excellency, for having invited me for this visit. I look forward, Excellency, to welcome you in my own country, India. 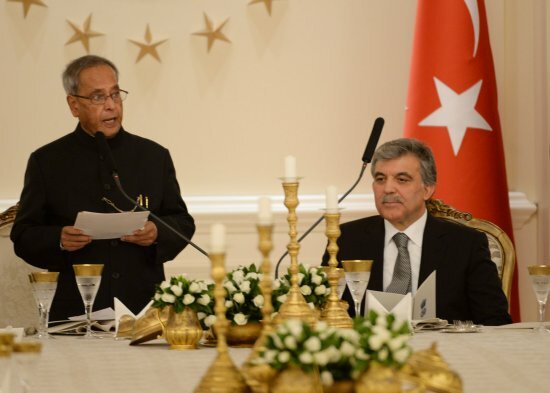 I assure you that the shared similarities between our two countries - Turkey and India – in hospitality, in welcoming guests and in our cuisine which you would have experienced while you were in India 3 ½ years ago, will equally enrich your visit. Our countries share bonds that go beyond a mere sharing of cultural heritage, arts and cuisine. As two emerging economies with congruent interests in several cross cutting areas, we should aim to reap the benefits of closer interaction. Our developing societies can engage across sectors; we are looking forward to enhancing academic exchanges and people to people contact. Being members of the G-20, we interact closely on issues affecting the global community. We are at historical cross roads; the decisions we take today will influence the future of this relationship. Excellency, it is my ardent hope that as two independent nations we will work together to make this world a better and safer place to live in and take our bilateral relations to greater heights of cooperation and mutual understanding. I am carrying back very fond memories of my visit to Turkey. Excellency, please join me in raising a toast for your health, and the progress and prosperity of the Turkish people. Let us rededicate ourselves to making our two countries focal points that will usher in peace and stability for our respective regions, and for the world as a whole.